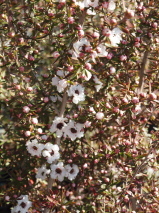 A hardy colourful compact upright tree with aromatic foliage, branches have brown flaky bark. The leaves are dark green, tinged light purple when young. 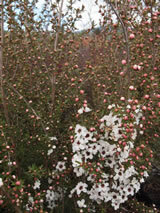 It has exquisite double white flowers in late winter and spring. Wonderful food for the bees. This is a cultivar of our most common native tree, it grows naturally in many different sites and is very hardy. Great for growing in difficult ground.